If you are captivated by cruising as well as fine dining, Regent Seven Seas’ newest ship may offer the Nirvana you seek. The 750-passenger Seven Seas Splendor, which will set sail in February 2020, will elevate the cruise line’s legendary cuisine by providing a focus on destination dishes that bring aboard local ingredients and culinary traditions from the locations to which the ship is sailing. 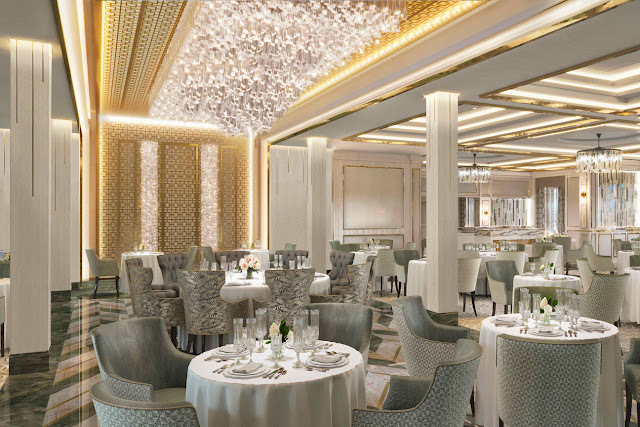 Cruise line officials say the on-board luxuries build on the success and guest favorites of sister ship Seven Seas Explorer. “Culinary arts classes”? Now you REALLY have my attention! While my wife and I thoroughly enjoy fine dining, we are also accomplished cooks, so the opportunities to experience new dishes and enhance our cooking skills in the same venue make this offering particularly appealing. 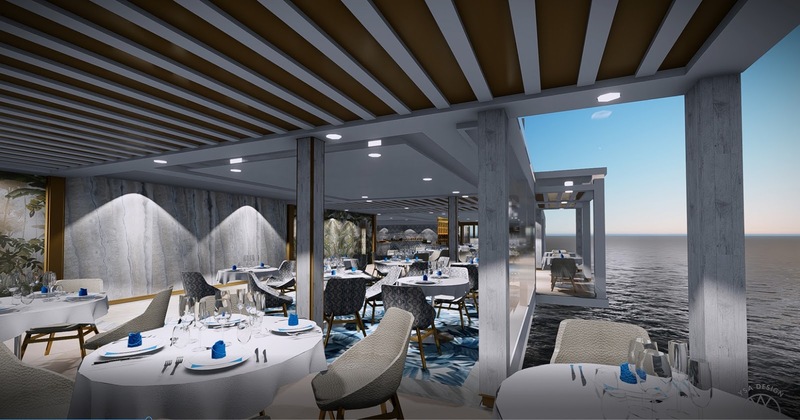 Even if you don’t enjoy cooking, the ship will include seven specialty dining venues, which should provide something for everyone. The largest of the venues is Compass Rose. A sophisticated atmosphere is set by exquisite chandeliers and dinnerware by Versace but the food is, of course, the star. 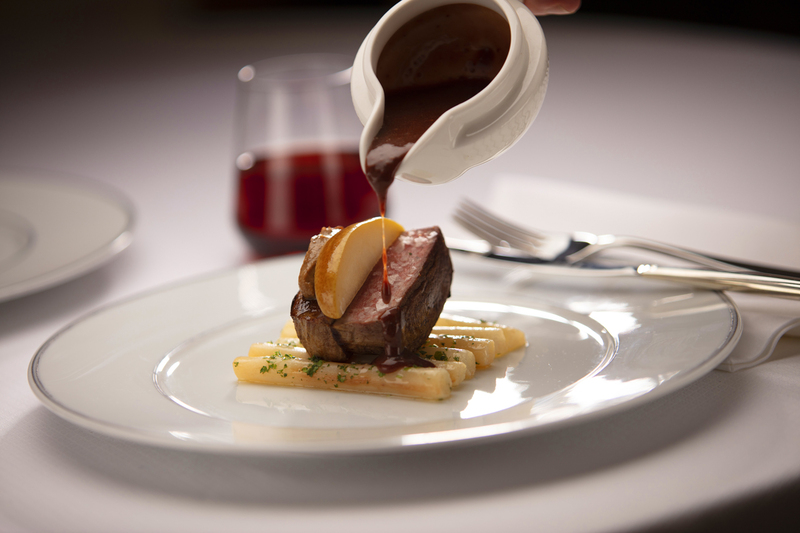 Dishes include a take on the classic Chateaubriand with red wine grain mustard sauce. As well, the restaurant will offer entirely new dishes including Malaysian-style braised beef short rib and grilled Branzino with cauliflower rice, barley, spinach, and pomegranate, among other inventive offerings. In Pacific Rim, rich culinary traditions come to life with a diverse array of Pan-Asian dishes. Those include dry ice sashimi, duck spring roll, and new Thai red chicken curry with coconut cream and crispy shallots. Passengers can start their day with breakfast at La Veranda while taking in the gorgeous ocean views. Buffet lunches can be enjoyed in a chic indoor dining room which features over-water alcove seating, or al fresco on the shaded, open-air deck. At dinnertime, the veranda becomes home to Sette Mari at La Veranda, which features authentic Italian specialties inspired by family recipes which were handed down from generation to generation. 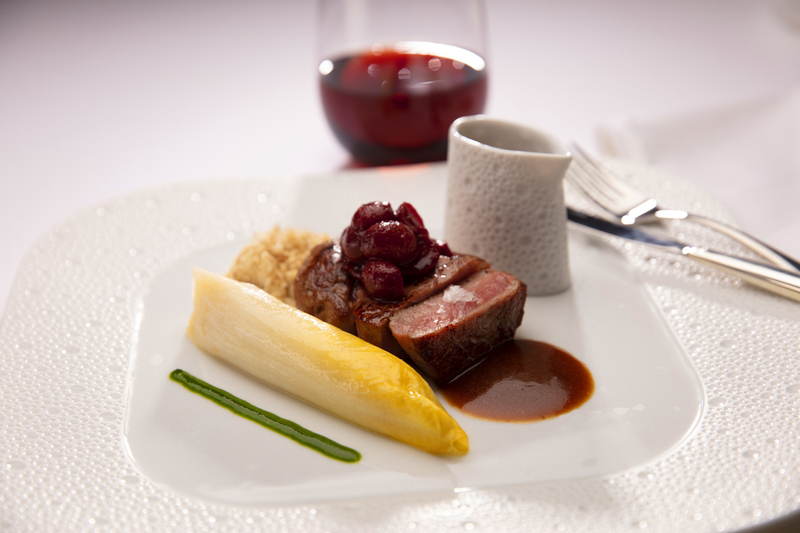 Tuscan wines complement dishes including spice-crusted tuna steak with braised endive, polenta and salmoriglio. Fans of French cuisine will want to experience Chartreuse. Evocative of a chic Parisian fine-dining restaurant, Chartreuse’s dishes offer a modern twist on classic French fare, including frog legs in garlic cream sauce or a tender veal rack loin with walnut veal jus sauce. Prime 7 is the ship’s steakhouse. Decorated with glass, metal and marble, Prime 7 offers classic American fare including prime New York strip, porterhouse and filet mignon steaks as well as seafood offerings like Applewood smoked salmon, seared diver scallops, and Hamachi ceviche. 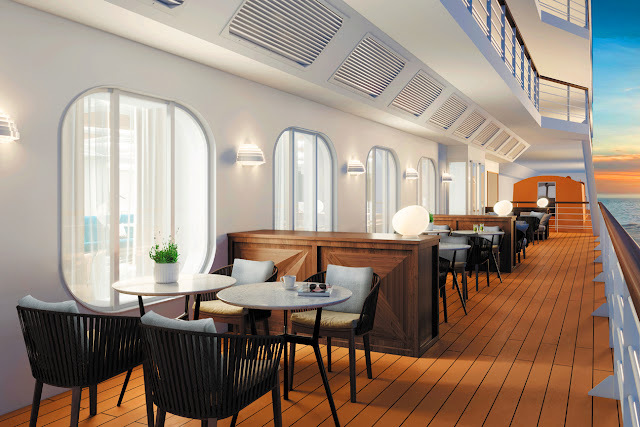 Other offerings include the Coffee Connection, which was designed to create the feel of a metropolitan café, and the Pool Grill, which features casual fare including regional barbecues and freshly grilled fish of the day. As much as I love great food and fine dining, my favorite aspect of the Seven Seas Splendor is the chance to get into the kitchen myself. 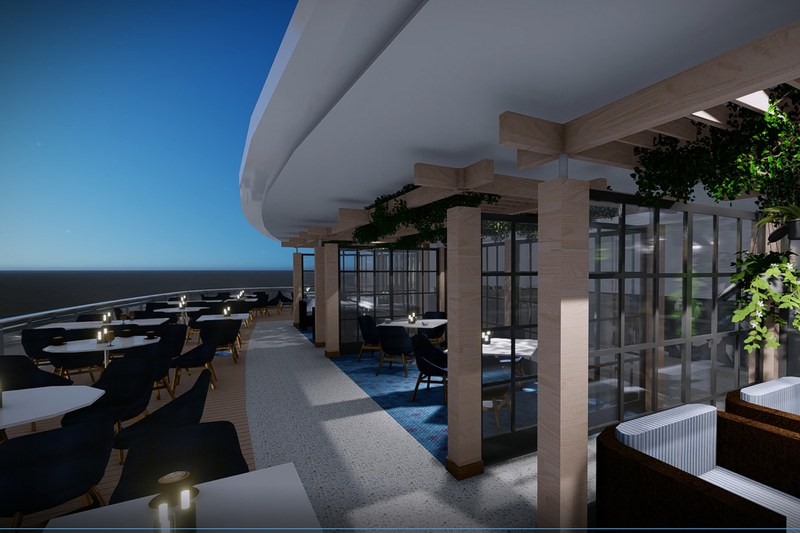 The ship will have a culinary arts kitchen with 18 individual cooking stations where guests can take part in 20 new culinary classes and learn professional techniques and recipes from master chef instructors. Those who are less hands-on but no less a gourmand will enjoy Gourmet Explorer tours for one-of-a-kind epicurean adventures. Personally crafted by Regent’s Executive Chef & Director of Culinary Enrichment Kathryn Kelly, guests will be able to choose from a variety of optional tours that take them to local markets to find exotic spices, sample delicious wines at breathtaking estates and savor gourmet meals expertly prepared by locally renowned chefs. Every cruise line offers specialty dining venues, sometimes in conjunction with a celebrity chef or personality. Princess Cruises has SHARE, developed with Curtis Stone and The Salty Dog with Ernesto Uchimura, while Carnival has paired with Guy Fieri and opened Guy’s Burger Joint and Pig & Anchor Bar-B-Que. Holland America has paired with Chateau Ste. Michelle winery for its BLEND experience which it developed in conjunction with its culinary advisory board of several chefs who are well-known in the Seattle area. While the food at all such venues we have experienced was fine, it seemed to us that the major draw was the affiliation with a celebrity name. That will not be the case with the Seven Seas Splendor, as the cruise line has made the obvious decision to let the food speak for itself.